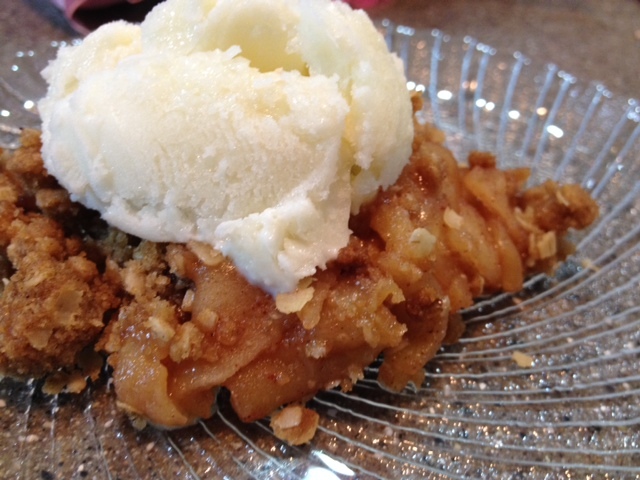 My husband came upstairs and said, “Whatever that is that you made – it actually tastes really good.” To some, this may seem a little…snarky? 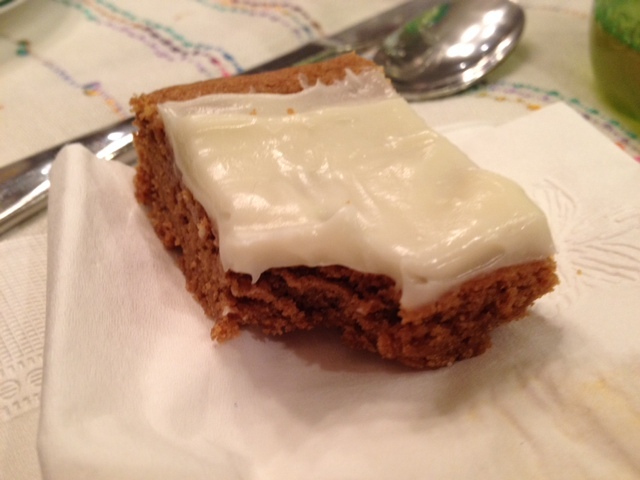 But coming from my husband – a man who’s dessert intake in strictly limited to rice crispy treats and brownies – it was a huge compliment. He ate one of my desserts, of his own free will, and he liked it. 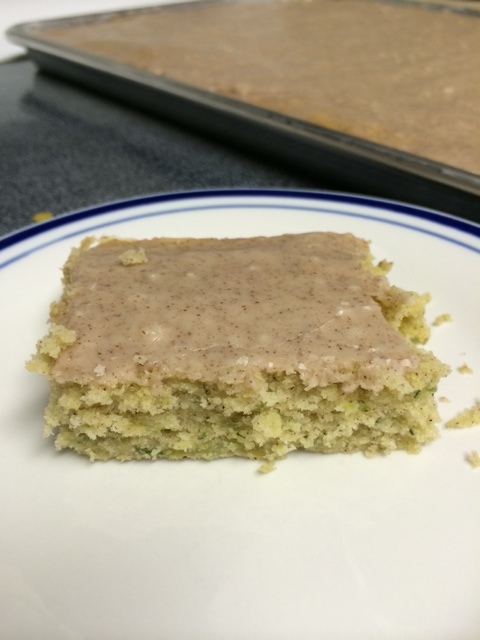 These turned out a little more cake-y than sugar cookie-y for me…it was my first try and I very well could have mixed them funny (I think I forgot to press the batter into the pan) – but regardless, they were really good. Definitely a repeat! Preheat oven to 350 degrees. In a mixing bowl whisk together flour, cornstarch, cinnamon, baking powder, salt and powdered milk for 30 seconds, set aside. In the bowl of an electric stand mixer fitted with the paddle attachment, whip together butter, brown sugar and granulated sugar until pale and fluffy, scraping down sides and bottom of bowl occasionally. Add in eggs one at time mixing until combined after each addition. Blend in sour cream and vanilla. With mixer set on low speed, slowly add in dry ingredients and mix just until combined. Butter and 13 by 9-inch baking dish, then with buttered hands gently press and spread cookie dough into an even layer in dish. 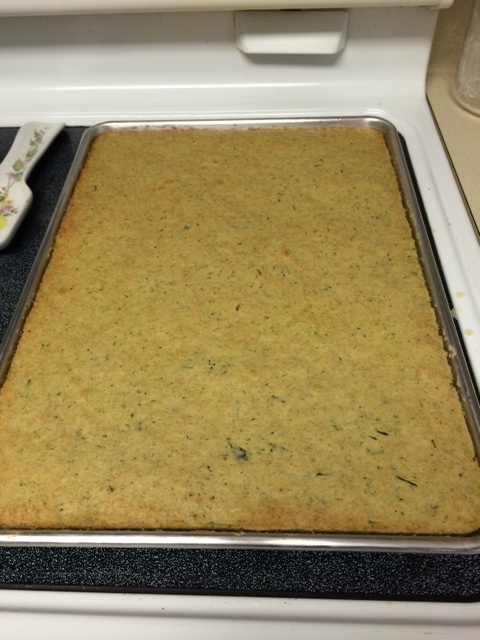 Bake in preheated oven until toothpick inserted into center comes out clean, 17 – 21 minutes. 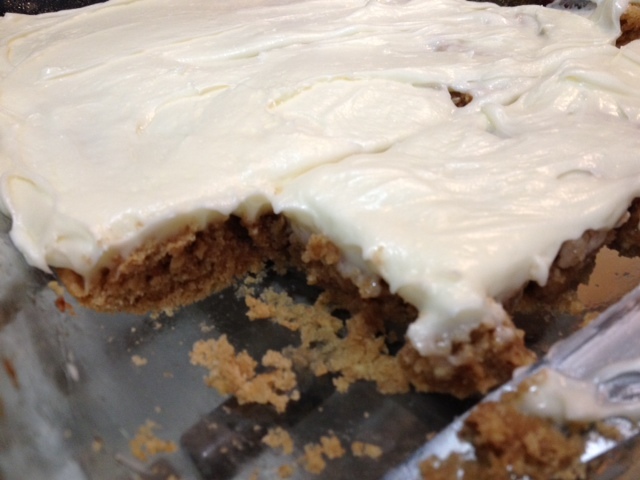 Allow to cool completely then frost with cream cheese frosting. Cut into squares and store in an airtight container. Preheat oven to 325^F. Line jelly roll pan* with foil or parchment paper and spray with non-stick cooking spray. Set aside. In a large bow, cream butter and sugars together until light and fluffy. Stir in egg, vanilla, and molasses. Whip 1-2 minutes, or until it turns a light brown color. Stir in remaining ingredients and mix until dry ingredients are just combined. Pour into prepared pan and bake 20-22 minutes or until edges are barely starting to brown. Cool completely. For the frosting: Whip all ingredients together until smooth. 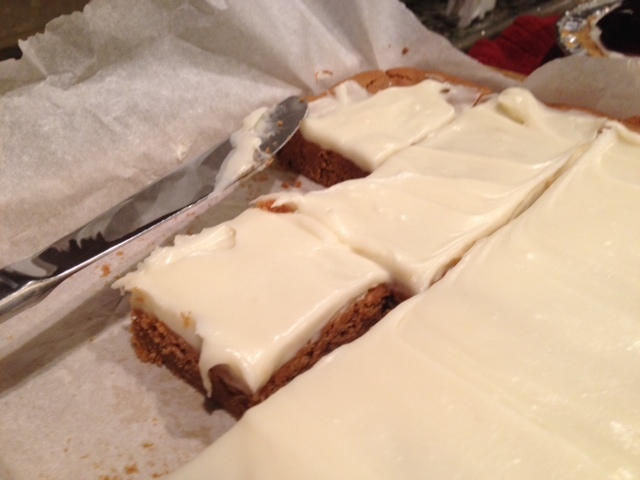 Spread overtop cooled bars and cut into squares. Serve immediately or store in air tight container. 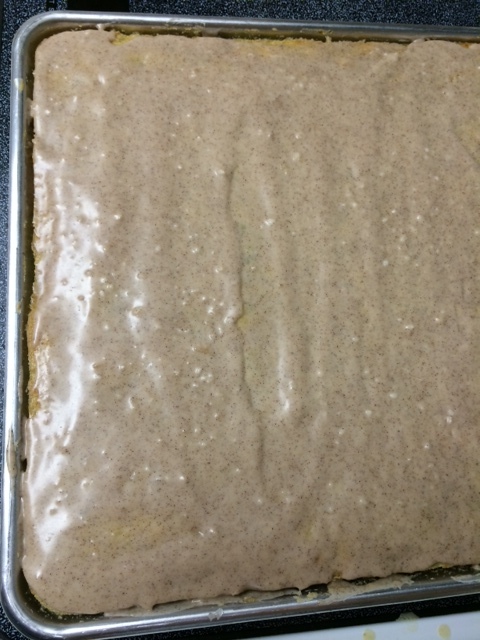 *If you don’t have a jelly roll pan, you can use a glass 8×8 dish and add 2-3 extra minutes to baking time. I asked my husband to make this Cinnamon Swirl Bread recipe that I found online, and was so excited when he finally did! When I took a few pictures of it, he asked, “Are you going to put it on your blog?” I said, “Of course!” And he added, “Well, I better give you the recipe then.” I was slightly confused, considering the fact that I was the one that gave him the recipe…or so I thought. 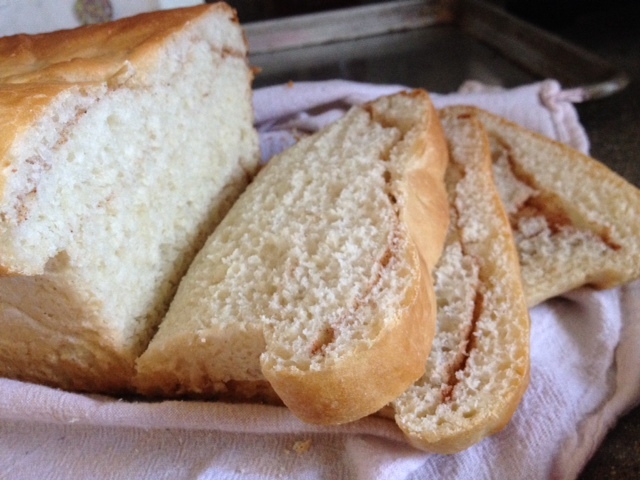 He’s been obsessed with making the perfect loaf of bread lately, and it’s a good thing I decided to add this recipe to the blog because, apparently, he made up his own and the only place it resides is in his head. 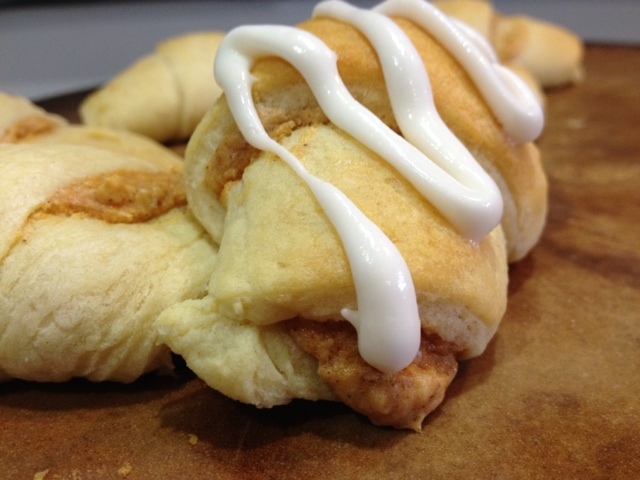 A sudden case of amnesia, and this piece of cinnamon-swirl, gooey goodness could have been lost to us forever. That would have been a real tragedy! That and the loss of my husband’s mind…I’d miss that too. In a smaller bowl, mix warm water and sugar. Add yeast and allow it to proof. Sift together flour and salt, then add yeast mixture. Knead together until dough pulls away from your fingers – a little sticky still and not too dense. Cover the dough and let rise to double in size. Roll out dough to 1/2″ inch thick rectangle and spread a layer of softened butter over surface (the thicker the butter, the more pronounced the marbling in your loaf). 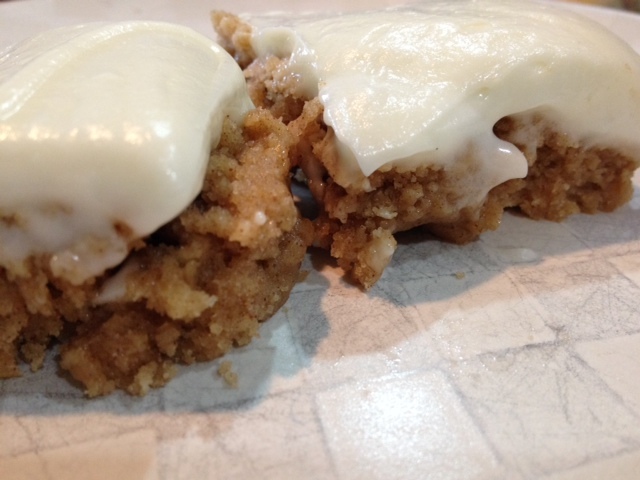 Sprinkle the butter layer with a generous coating of cinnamon/sugar mixture. 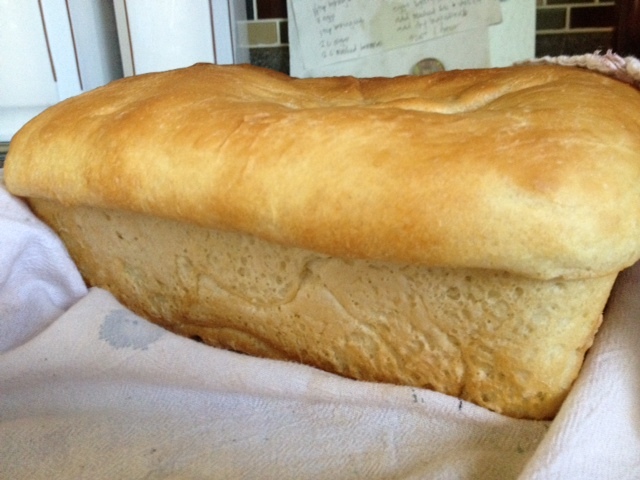 Fold the dough in thirds long-ways, then fold in thirds again from the opposite sides, forming a loaf. Place in greased bread pan and bake at 350^F for 20 minutes. When bread is done baking, remove from oven and brush top crust with butter. Best when served warm! *You can use regular flour, but bread flour allows your loaf to rise and hold it’s shape better. Our all-purpose flour loaves always turn out much more dense.